Developed by the world-renowned Culinary Institute of America (CIA), this DVD demonstrates how to choose the right knife for the job and how to use it correctly. Designed for both professional and amateur chefs, beginners or those wanting to brush up on their skills, the easy-to-follow instructions cover all of the basic knife cuts and t... more. Classic cooking methods are the bedrock of the successful and innovative culinary professional. 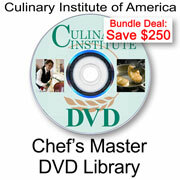 Deepen your understanding of the all-important cooking fundamentals with this third in a series of three DVD's by the Culinary Institute of America - Moist Heat: Steaming, Submersion Cooking, Braising & Stewing... more.